Support Renew – become a member! ReNew 139 delves into sustainable transport, with a new look at where the EV market is heading for all types of vehicles, including a special spotlight on the fastest growing transport sector worldwide: e-bikes. We gain insights from several EV owners with great stories, including an EV charged from solar and a home charge station on the public charging network. We also update our efficient hot water buyers guide – perfect if a new system is on your horizon or if you are transitioning to an all-electric house. Plus: DIY thermal imaging to find draughts, a solar + battery system saving students money, building with nature in mind, whether hydrogen is a viable fuel, the pros and cons of driverless cars, the future of long-distance travel, selecting plants for your garden and much more! SKU: R139. Category: Renew. 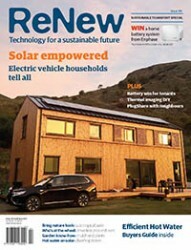 Tags: EV, garden, green building, ReNew, Solar. Issue 139 is hot off the press and full of advice for your sustainable home this autumn. As always, ReNew comes overflowing with articles to satisfy both the technically and the not-so-technically minded. Regardless of whether your interest is using thermal imaging to find leaks in your building envelope, hot water system options, how to charge an electric vehicle from the sun or what’s happening to make long-distance travel more sustainable, there is something for everyone in this issue. In a story we don’t often hear, fossil fuel use is plateauing at the same time as economies, such as China’s, are growing. Peter Newman explores what’s going on. Will driverless cars transform our cities for the better? Transport expert John Stone explores the pros and cons. With e-bikes the fastest growing transport sector at the moment, Elliot Fishman looks at what’s happening in Australia and worldwide. The EV market has grown phenomenally in both sales figures and options—though not so much in Australia. Bryce Gaton describes what’s happening worldwide. The core part of an electric vehicle is its battery pack so you’ll want to give it the longest possible life. From PlugShare to a plug-in Prius conversion to charging from the sun, eight electric vehicle owners describe how they’ve made an EV work for them. Hyperloop, high-speed rail and electric planes: Lance Turner takes at look at where we’re heading. Are hydrogen-fuelled vehicles really a viable alternative? Lance Turner takes a realistic look at using hydrogen for transport and energy storage. The split incentive with solar savings going to tenants rather than owners means apartment buildings often miss out on solar. This project shows it can be done, and with batteries as well. Indigenous, non-indigenous native or exotic: which plants will grow best and which are the most sustainable? Warren Worboys from the Australia Garden gives guidance. Richard Proudfoot describes their house and garden build in the sub-tropics, and the birdsong-filled results. After using thermal imaging to find and fix leaks from window frames and around heating ducts, Jean and Barry Lambert are almost looking forward to their winter energy bill! If your old hot water system has seen better days, maybe it’s time for an efficient replacement. We show you how solar and heat pump hot water systems work, what’s available and how to choose one to best suit your needs. Five reader stories and five different systems that illustrate there’s more than one way to get into hot water! Tony’s war on renewables may be ongoing, but what has been the effect? It’s not such an easy war to win, writes Alan Pears. Get the building envelope as good as you can before focusing on the bling, says long-term ATA member Dr Wendy Miller. She talks to the ATA’s Richard Finn about what she’s gained at home and at work in her two decades in the sustainability arena. First visit to the Renew webshop? If you are a Renew Member you need to Reset your password! Read our FAQs about how to make your purchase. Read more about possible causes and workarounds. 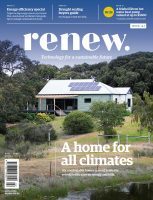 The Alternative Technology Association trading as Renew is Australia’s leading not-for-profit organisation promoting sustainable technology and practice. To download a PDF copy of a magazine, simply add it to your cart and if you have the appropriate membership you will be given 100% discount on checkout.